Many leading pragmatists have contributed to political debates and some of them have had considerable influence on policy-making. John Dewey’s writings on American and international politics reached a wide audience and in recent years Richard Rorty and other pragmatists have had considerable influence in political and cultural debates. Still, pragmatism’s contribution to politics and political theory is at the same time interesting and in a way confusing. There is no political theory associated with pragmatism yet pragmatist influences are easily detected in the major political and ethical theories of the last decades, such as Rawls’s theory of justice and Habermas’s discourse ethics. These influences sometimes counter or compete with Kantian influences, appearing as an attempt to bring political theory closer to actual problem-solving in social contexts. The most interesting pragmatic contribution to political philosophy is probably to be found in Dewey’s works, especially in his writings on democracy and liberalism. Deweyan democracy implies an emphasis on substantive rather than procedural forms of democracy. At the same time Dewey is committed to pluralism and thus his approach creates a fresh perspective on both multiculturalism and deliberative democracy. Contemporary debates on the presence and avoidability of multiculturalist approaches in political decision-making often seem to present the options as accepting relativism or sticking to absolutist or chauvinist views on political culture. But these are certainly not the only options and maybe not the clearest options at all. Pragmatism may offer a way of diversifying political discourse by generating demands on political vocabularies of being relevant to solving real and tangible political problems, rather than narrowing political focus down to one or a few central issues which then are used to define or characterise the whole political spectrum. The Second Nordic Pragmatism Conference – Pragmatism in Society and Democracy brings together prominent American and European scholars of pragmatism with their Nordic colleagues. Its aim is to create a context for further contacts and cooperation among philosophers working on pragmatism both in the Nordic countries and elsewhere. 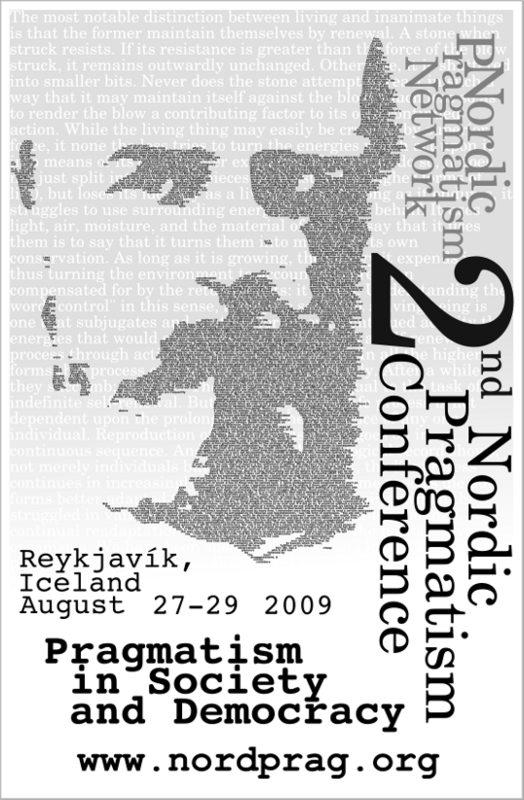 The conference is arranged by the Nordic Pragmatism Network in Reykjavík, Iceland, with financial support from the Joint Committee for Nordic Research Councils for the Humanities and the Social Sciences (NOS-HS). The conference sessions take place at IDNO, 2nd floor conference room, Vonarstræti 3, 101 Reykjavík. See map of the location. All participants are kindly asked to register to the conference upon arrival. Rooms at Hotel Plaza have been reserved for the conference participants. Revolutionary Pragmatism: What is a Pragmatist Approach to Upheaval? Pragmatism and Engineering: A Vital Connection? Is pragmatism inherently melioristic? A desire to improve the future lot of human beings in this world certainly seems to permeate many strands of pragmatist thought. The characteristic emphasis on change and practice, in contrast to exaltation of permanence and pure theory, seems to render pragmatism particularly supportive of melioristic aspirations and projects. The endorsement of meliorism is also a popular target of critics of pragmatism. Pragmatists have not only been accused of opportunistic utilitarianism; they have also been ridiculed as naive do-gooders, whose melioristic path may turn out to be road to hell paved with the best of intentions. Ironically, some of these criticisms are anticipated in C. S. Peirce’s conservative “sentimentalism”, which in effect forbids scientists and philosophers to meddle with established traditions and everyday morality. To clarify the melioristic commitments of pragmatism, it is not only necessary to distinguish meliorism plainly from optimism and pessimism, but also to differentiate varieties of meliorism within pragmatistic thought. The conceptions of meliorism that emerge from the writings of William James, F. C. S. Schiller, John Dewey, and Richard Rorty differ in several critical respects. Given this diversity – and Peirce’s misgivings – one might reasonably question whether there really is any special connection between pragmatism and meliorism. Nonetheless, I argue that pragmatism contains the theoretical core of meliorism in the idea that philosophy is at heart a matter of enriching experience and improving habits of action – a contention traceable to Peirce as well as to James and Dewey. Democracy is the most central theme in John Dewey’s work. From his earliest writings until the end of his life, he returned again and again to explore the meaning and consequences of democracy. Whether he is dealing with the character of experience, inquiry, education ethics, politics, religion, or art, Dewey is directly or indirectly concerned with the consequences for democratic practices. I begin my discussion with an analysis on one of Dewey’s earliest essays, “The Ethics of Democracy.” This early paper sets an agenda that Dewey explored throughout his life. I examine the various strands in Dewey’s vision of democracy and his critique of the failures of democracy I argue that Dewey’s vision of radical democracy is relevant to contemporary discussions of liberalism and communitarianism as well as to theories deliberative and agonistic democracy. In A Pragmatist Philosophy of Democracy, Robert Talisse claims that Deweyan democracy is not compatible with the fact of reasonable pluralism. Talisse understands Deweyan democracy to be predicated on a comprehensive conception of the good, namely Dewey’s conception of human flourishing (“growth”). Deweyan democracy is thus reasonably rejectable, according to Talisse. Against this, I will argue that the Deweyan view is not clearly susceptible to the charge of reasonable rejectability. I aim to show this by arguing that the core elements of Dewey’s conception of growth are included in Martha Nussbaum’s capabilities theory of justice. This theory, while predicated upon a particular conception of human flourishing, is intended to be the object of reasonable agreement. I will conclude, therefore, that Deweyan democracy can also be the object of reasonable agreement. For pragmatist social theory, habits are the main mechanism behind structuration; that is, they are the mechanism explaining the durability of social structures. Structuration is undoubtedly related to power relations. However, this aspect of power has not received adequate treatment in pragmatism. The importance of societal power relations certainly is present in the work of John Dewey, but Dewey’s remarks on the nature of power remain somewhat unsystematic. One candidate for a theory of power is to be found in the work of Pierre Bourdieu. The obvious similarities between pragmatism and the theory of Bourdieu have been noted before but the further implications of this fact have not been explicated. I argue that Bourdieu’s concept of habitus can be defined so that it consists of particular kinds of habits. Thus, habitus is related to such particular habits and social structures that are hierarchical and organized along status positions. Accordingly, Bourdieu’s conception is well equipped to deal with power (i.e., the reproduction of status positions), whereas pragmatism is a more general theory of action. While continuing to engage in intra-disciplinary dialogues with analytic and continental philosophers, contemporary pragmatist philosophers in the classical American tradition must develop a three-part public philosophy. Like Peirce, James, Dewey, and Rorty, we must challenge prematurely settled logics, ontologies, and epistemologies to make room for better intellectual tools. In addition, we must combine empirical evidence and well-crafted arguments with pragmatist versions of phenomenology and story-telling to address a effective “critique of critiques” to philosophers and other scholars who employ unwarranted truth-claims and outdated research platforms. Finally, as agents of a more deeply democratic future, at least some of us also must direct our energies to serving actively as Deweyan “liaison officers” within collaborative public inquiries that include specialists in many disciplines as well as a wide public who contribute diverse cultures, experiences, interests, and capabilities. Within such inquiries, pragmatists’ philosophical work includes advancing democratic ideals, spurring social hopes, analyzing information, clarifying claims, interpreting diverse participants to one another, and proposing transformative strategies for reconstructing or creatively adjusting to our local and global problem-situations. Dewey’s conception of democracy is widely associated with his views on education, community, and the reconstruction of the ‘liberal’ individual. This paper argues that a complete portrait of a successful, pragmatic democracy must also include its epistemic dimension. Democracy flourishes when individual citizens and their communities engage in certain kinds of epistemic practices and avoid others. These practices are not narrow in scope, but span the educative, communicative, and imaginative arenas. Because Dewey’s notion of “experience” underwrites this epistemic basis of democracy, the paper concludes by (a) explaining the connection between experience and epistemic practice and then (b) raising for discussion several doubts about whether “experience” is a notion which is coherent and useful tool for philosophers of democracy. Theories of agency often inform larger scale political theories and the practice of political science. Specifically methodologically individualist models of social science refer almost unanimously to a theory of agency widely known as the rational actor model. Embedded within this model is a deeper theory of practical reason. This theory of practical reason has been devastatingly criticized in the philosophy of science and the philosophy of social science from a variety of schools and perspectives. Within professional political science perhaps the most famous critique has been offered by Shapiro and Green in The Pathologies of Rational Choice Theory. This paper charts two alternative and separate criticisms of the rational choice model that then generate a wider theory of agency that is dependent on a theory of practical reason that relies much more heavily on the faculty of imagination both in terms of projecting ends and in terms of articulating ideals that circumscribe contexts of action to the point of becoming foundational for the agent relative descriptions of those action contexts. The first alternative I shall briefly discuss to the rational choice model still remains immanent to mainstream political science and firmly fixed in methodological individualism: this alternative highlights framing effects and path dependence critiques of instrumental, or neoclassical, models of practical reason. The second alternative stems from the Aristotelian tradition of practical reason and includes such proponents as Alisdair MacIntyre and John Dewey. While seemingly strange bedfellows on the face of it, what this paper shows is that the divergences of Dewey and MacIntyre overall in terms of their narrative of modernity and their verdicts on social science, pale in comparison to the similarities of their common radical critique of what Habermas has referred to as ‘subject centered reason’ at the root of methodological individualist political science. Each offers a novel and dramatic account of practical reason that this paper will outline as an alternative to both the rational choice models and the immanent critics mentioned above, pointing to a different conception of political science, in particular, pointing to the critical nature of what Dewey termed ‘social inquiry’ in the penultimate chapter of his 1938 Logic: the Theory of Inquiry. The critical character of this model and its dependence on imagination will be sketched in closing. There are significant differences between the neopragmatism as formulated by Rorty, based on James’ and Dewey’s pragmatism, and what Peirce, in order to distinguish his own approach from the last two thinkers, called pragmaticism. I take in this paper the concept of community as a focus, from which those differences will be implied, albeit many other points could be chosen. I highlight that the usual Rorty’s sentence beginning with ‘we pragmatists…’’ shall necessarily exclude Peirce. Exemplarily, I could mention the concepts of representation, which for Peirce has nothing to do with mirror, and of truth that, for him, also has no relation at all with fixed essences. Those differences will not only mark a very clear border between the two concepts of pragmatism, but also will question how the idea of community can be supported only by dialogical agreements, without the anchor of common open human experience. Pragmaticism and neopragmatism differ not only regarding their specific range of philosophical problems but, moreover, on what kind of problems they really consider as genuinely philosophical. In a number of articles, Rorty argues that Dewey’s (and the early pragmatists’) invocation of ‘experience’ was a mistake, and argues for replacing ‘experience’ with ‘discourse’. In other articles, Rorty suggests that ‘experience’ can be replaced by ‘non-inferential causes of statements’. In this paper, I examine Rorty’s claims about experience against the background of similar discussions in Quine and in feminist political theory, notably the critique of experience offered by Joan Scott. I argue that Rorty’s attempt to replace ‘experience’ with, on the one hand, ‘discourse’ and on the other hand ‘non-inferential causes of statements’ represents a see-sawing back and forth between understanding ‘experience’ as operating in the “sphere of reasons” and, dichotomously in the “sphere of causes”. I argue that Rorty’s critique of the early pragmatists’ appeals to experience is due to his failure to recognize the extent to which the concept of experience they drew upon evaded this dichotomy. Engineering is a very pragmatic discipline and the engineers, as problem solving agents, are trained in viewing real effects and practical consequences to be about the only truth there is: If it works then it is true! The lecture discusses the philosophical implications of this for engineering and its practical meaning for philosophical pragmatism. One of the key factors in social interaction is establishing mutual understanding. In classical semantics, misunderstanding can be construed as inconsistent sign–meaning couplings across language users. In the classical approach, meanings, or senses, are considered uniform and unchanging across language users. This approach is, however, insufficient. If meanings were uniform, there should exist no grounds for misunderstanding once compatible sign–meaning relationships had been established. Following the American pragmatist C.I. Lewis, meanings should be analyzed intensionally, not extensionally. That is to say, semantic analysis should target primarily the application of a term, not only its denotative range. According to Lewis, meanings can be construed intensionally as conjunctions of terms. By rendering explicit the intensional meaning of key propositions or terms involved in a social conflict, misunderstanding may be resolvable. Pragmatic conceptual analysis may thus yield semantic tools that can be utilized to expedite understanding in social conflict. Pragmatism is famous as a background philosophy of various versions of social theory, but many depictions seem not to be aware of pragmatism’s particular character as a philosophy. Social theory always consists both empirically descriptive and normative ingredients. The crucial point is that in pragmatism those ingredients are presented in a strange order, because pragmatism understands the workings of the human mind altogether as normative phenomena, explicitly or implicitly. “Inhibition” is the key term here. If this is understood, it follows that the late R. Rorty’s interpretation of pragmatism turns out not to be of lasting value, because it never did bring out the above principle sufficiently. We should thank Rorty for salvaging pragmatism from oblivion, but that is all – not for reasons of piety toward the original classics, but in regard to present-day needs. The presentation deals also with pragmatism’s relation vis-à-vis analytic philosophy and phenomenology, and defends pragmatism’s sui generis character and independence of both of them. I will be outlining the senses in which Cavell’s outlook on Emersonian Moral Perfectionism is not only compatible with but a precondition for genuine democracy. While passing reference will be made to John Rawls’s criticism of perfectionism in his Theory of Justice, the main emphasis will be on Cavellian insights in relation to Emerson’s essays. Rorty’s Anti-Relativism Against the classical absolutism/relativism dichotomy Rorty suggests that this alternative is to be avoided by taking a standpoint negative towards both. In his argument for a way to wrangle out of the dichotomy Rorty follows a strategy to minimalize or even eliminate cognitive vocabularies, above all truth-talk. By doing this Rorty left us with the task of inquiring more closely into the possibility of cognitive claims which can be downgraded enough in order to evade the absolutism/relativism dichotomy. Even if plausible as a strategy against absolute philosophical claims to truth and knowledge, cognitive claims in the more common everyday sense also may open themselves to the question of relativism. Or does the dichotomy fall away simply by evading philosophical claims to knowledge, even if in a speeial sense of the included concepts only? I hope this will do. As an approach to political problem-solving pragmatism seems to prefer reform to revolution. Pragmatists can still be radical, but since they will emphasize ends or objectives that can be developed starting from the situation we are in here and now, pragmatism is deeply anti-utopian and in a way anti-ideological as well. When an original situation however is not a stable system, but a chaotic transition, such as may be the case in a time of crisis, pragmatists must think differently. Revolutionary times offer an opportunity of revolutionary change, but do they offer an opportunity for pragmatist theory? Can pragmatism be revolutionary, and if so, what does it mean? I distinguish three challenges – I prefer to talk about “challenges” instead of “threats” – facing the human sciences in today’s socio-cultural and academic life: technocratic instrumentalism, scientism, and postmodern relativism. I will briefly discuss these three challenges in turn, starting from the most general one and ending up with the one most clearly internal to the human sciences themselves (i.e., relativism), and consider how they should be met by the academic community dedicated to pursuing and advancing humanistic research and education. This will lead up to a critical discussion of the relation between science and democracy. The pragmatist tradition, in my view, provides us with unique resources for an enhanced understanding of this relation. Richard Rorty famously argued that liberalism and solidarity cannot be justified by philosophical means – nor do they require any such justification. Even granting this much to Rorty, liberalism occupies an uncomfortable position in his work. Throughout his writings, Rorty proposed a variety of views about another central philosophical notion, truth. Three such views can be distinguished: a conversational “ethnocentrism” according to which truth is whatever we can convince other members of our community about, “pragmatism” which assimilates truth with usefulness or the advancing of one’s goals, and deflationism or minimalism which holds that there is, aside a formal definition of truth, nothing substantive to be said about the concept over and across different uses and practices. I will argue that each of these three notions will be problematic in the larger context of Rorty’s thought. The two first alternatives, pragmatism and ethnocentrism, make good sense of another central Rortian tenet, a scientific naturalism according to which science both provides us with tools to cope with our environment and is best performed in liberal communities immersed in solidarity and freedom. However, these views of truth, as I hope to show, are inconsistent with Rorty’s claim that truth or striving for truth does not exceed aiming at warrant. The only available alternative for Rorty turns out to be a deflationist notion of truth, which indeed becomes most prominent in his later writings. While this notion is itself not susceptible to an easy refutation, it obviously cannot be used to explain why truth seems to require freedom, and why science is especially advantageous when practiced under the condition of liberty. As an aside, I will argue that Rorty’s position may ultimately become surprisingly close to a confused version of that of the founder of pragmatism, C.S. Peirce. Yet all experience is an arch wherethrough Gleams that untravelled world, whose margin fades For ever and for ever when I move.Rather than being a definite account of what constitutes experience Dewey’s idea is an attempt to change the terms of debate. It is a political project or a plea for change and the metaphor of ‘art as experience’ challenges the ‘high-art’ conceptualisation by giving attention to the aesthetic experience in life and in commonplace events. This essay addresses a specific issue concerning the history of naturalism in America. It begins by discussing the socially progressive stance of Dewey’s pragmatic naturalism and its place within the larger movement known as Columbia University naturalism. Given the centrality of this conception of naturalism during the 1930s and 1940s , it wonders how a label commonly associated with Dewey’s influential social-moral project could later represent the asocial philosophical vision of Quine in the 1960s? It argues that part of the answer is found with Ernest Nagel’s criticisms of Dewey’s naturalism in the 1950s, where he rejects the view that scientific reasoning can serve in the selection of human ends and values. Nagel’s critical remarks indicate an important shift away from a socially engaged conception of naturalism concerned with promoting a proper empirical study of moral value towards the more specialized empirical projects exemplified in later forms of naturalism. More generally, these changes indicate a profound divergence along social and moral dimensions with regard to the central import underlying the naturalist’s use of continuity, and they further highlight the lack of social and moral perspective that was typical of Cold war conceptions of the philosophical profession. I focus upon how much the idea of democracy is rooted in pragmatic aesthetics or, more broadly, in the philosophical tradition of American pragmatism. Despite serious differences in particular philosophies within this tradition, there is a similarly strong belief in Ralph Waldo Emerson (in the proto-pragmatic part of his Transcendentalism), John Dewey, Joseph Margolis, Richard Shusterman, and others, that some kind of reference to democratic values (e.g. pluralism, openness, tolerance) and to democratic institutions (e.g. free and open education) should constitute aesthetics and help articulate its major message(s). For example, the aesthetics of Dewey (Art as Experience) and Shusterman (Pragmatic Aesthetics. Living Be! auty, Rethinking Art) can show us explicitly, how much the growth of the meaning of the 20th century popular art in Europe can be inter-connected with democratic tendencies over there; at the same time they show how much the promotion of the so called “high” art in the past could be linked with the cultural, political, and institutional power of Europe’s elite of the 19th century. This article discusses the traditions of Pragmatism and German Idealism. We can usually only find differences and tension between these two traditions. What we are looking at is the theory of action in Pragmatism and German Idealism, especially John Dewey’s concept of self-activity and Johann Gottlieb Fichte’s concept of consciousness and action. In this paper I argue that Dewey’s and Fichte’s concepts of action and consciousness have certain similarities that can be understood as a direct influence of German Idealism on American Pragmatism, or are merely idiosyncrasies of both these traditions. We then examine what kind of political and social philosophies can be derived from certain concepts of action and consciousness in the cases of Fichte and Dewey. I have argued recently that Deweyan democracy is unable to accommodate pluralism and is thus untenable; I have also argued that a Peircean conception of democracy can give pragmatists all they should want from democratic theory. Through engagement with some of my critics, I develop in this paper a more precise version of my criticisms of Deweyan democracy and a more modest version of the Peircean alternative. I argue that Peircean democracy is far more limited in its social implications than Deweyans may like. Hence pragmatist democratic theory must become more modest in its ambitions; in order to be viable, pragmatist democratic theory must move conceptually closer to certain non-pragmatist views. Although some pragmatists will find in this recommendation an unacceptable capitulation to the philosophical status quo, I close the essay by making a case for the pragmatic necessity of bringing pragmatist philosophy into close contact with non-pragmatist views. Contemporary projects on deliberative democracy and democratic citizen participation that have become effective and influential guides for scholars can draw strength from renewing their earlier American pragmatist roots, especially by revisiting the works of John Dewey, George Herbert Mead, and Robert E. Park. Both deliberative theorists who look to Jurgen Habermas as a guide and citizen participation theorists who look to Thomas Jefferson and the Port Huron Statement can clarify and strengthen their distinctive yet related projects by reclaiming and advancing the originary pragmatist insights they share. As these “common root” thinkers in American pragmatism have argued, we need a “deep” or “personal” understanding of democracy, not just as a representative form of government, but as a way of life in which citizens together shape a mutually desirable future to the greatest extent possible. In this paper, I develop a pragmatic critique of the contemporary religion in politics-debate, with special focus on John Rawls and his supporters/critics. I argue that both sides of the debate rely on a flawed conception of religion/comprehensive doctrines, and that pragmatism offers conceptual resources (in terms of what I call “life orientations”) that enable us to develop a more nuanced debate. I end with some comments on what the consequences may be for how we think of the question of religion’s role in politics.